For those of us living at the valley floor in the Pacific Northwest, in general the threat of a hard frost will pass by mid-March. Once the threat of a hard frost passes, it's time to give roses one last pruning. 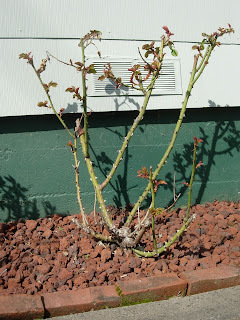 It is commonly recommended here in the Pacific Northwest to prune rose bushes in early November to avoid the roses becoming torn from the ground during a windstorm, which we often get in Nov-Dec. This first prune is a simple trim to bring the overall height of a rose bush to two - three feet. In late winter, the second and more precise trim is required to promote healthy and vigorous growth, all the while keeping the bush manageable (not six feet tall). 1) Use a sharp clippers. 2) Cut at a 45 degree angle, choose a spot where a new bud is forming, one that is facing towards the plant, and cut about a quarter inch above the bud. 3) Keep 3 - 5 strong canes, cut the rest down. Try to keep the center of the plant open. 4) Cut off any small suckers or canes that are smaller than the width of a pencil. 5) Clean up any remaining dead leaves, either on the plant or in the beds. 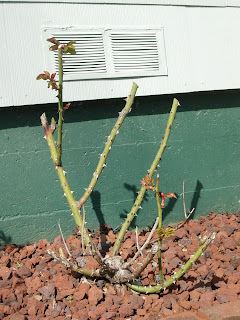 In the pictures above, I have shown a rose that is 'Pre' spring trim and 'Post' spring trim. I picked a nice (and rare) mid-march sunny day and trimmed up the roses. I hope for a large bounty of blooms come June and through-out the summer.